Checkout this video on the best small refrigerated trailers made in the USA! Tom McBride: Inside this short video I put together for you, you’ll discover a little-known but fatal mistake people make when buying a refrigerated vehicle on their own and exactly how to avoid it. I’ll also reveal the fastest way possible for earning more cash using this simple asset. My name is Tom McBride, and I’ll tell you why I invented this small refrigerated trailer in 1998 and how I’ve helped folks like you save and earn thousands in a moment. However, since our time is short, let’s cover that cash-generating tip first. There’s an extremely high need in your area for small, portable refrigeration. Think about it. How many businesses like yours rely on refrigeration to keep their product frozen or refrigerated? I’ll bet more than you can imagine right now. Did you know that refrigeration has had a huge impact on industry, lifestyle, agricultural and settlement patterns in the last 100 years? Areas that were thought to be unsustainable, like Houston, Texas and Las Vegas, Nevada now thrive from refrigeration and the ability to keep food for daily consumption.You get the significance. Refrigeration, it’s pretty important. Here’s the good news. The market is flooded with tractor trailers and large trucks for consumers, but nobody has a solution for the small to midsize businesses in your area that need extra storage or distribution until now, when you show up with your new, small refrigerated trailer as a rental program solution to your new potential customers. Most of them didn’t even know there was a solution like this available. This is the ultimate position to be in, and you’re already running in the circles of people interested in your new refrigerated trailer. While you can take this tip and apply it immediately and generate a new revenue stream for your business, you must first be warned about the number one mistake others make when it comes to refrigerated trailers. It’s a mistake that can lead to lost revenue and ticked off customers. You must avoid the DIY project trailers and ice merchandisers that are bolted down to a trailer. Here’s why. First, ice merchandisers offer no structural support that’s needed for over the road travel. Even though they’re easy to cam lock together and install, they provide no structural support for everyday use. Don’t let DOT catch you with them. Second, people use off-the-shelf refrigeration, designed for a stationary application. They buy a condenser and an evaporator and connect them with soft copper lines that are going to snap off when used in transport. Lastly, they buy a refrigeration unit without defrost or with the wrong defrost setup. These few items make the largest impact. Here’s the really good news. Simply by avoiding ice merchandisers and other cargo trailer retrofits, and using a few additional strategies I’ll be sharing with you in less than a minute, here’s what you can experience. Waking up tomorrow with more cash in the bank without having to take out a loan. Experiencing the freedom that comes from the profits you so richly deserve. Perhaps best of all is not even having to think about paying an expensive specialist to fix your equipment. Introducing Cooler Trailers, the revolutionary way to store and distribute your frozen or refrigerated product with just 110 volts or a generator. My proven Cooler Trailers will empower you to profits instantly. Now, you can blast through the day with ease, delivering your product at the correct temperature. Erase any thoughts of sore back and knees from working in cramped space and generate more profits faster and easier than ever. Plus, create a new income stream for you and more. 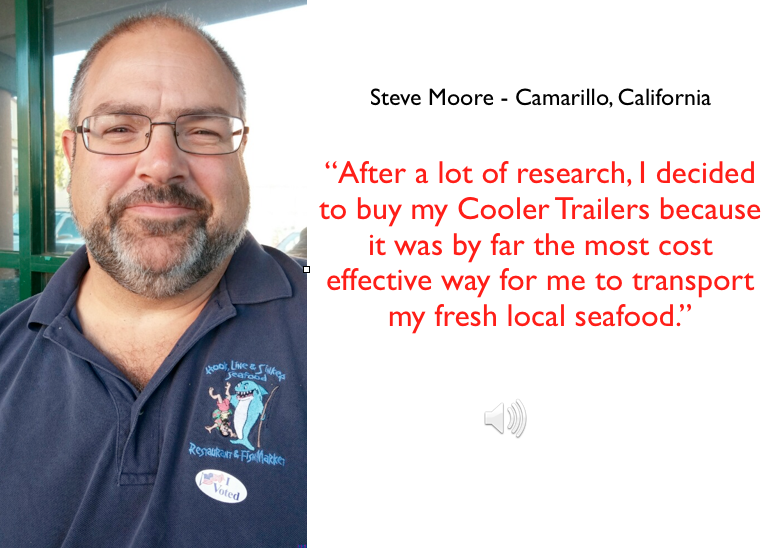 Steve Moore: Hi, I’m Steve Moore from Moore’s Seafood in Camarillo, California. After a lot of research, I decided to buy my Cooler Trailers, because it was by far the most cost effective way for me to transport my fresh, local seafood. Not only did I save tens of thousands of dollars on the initial purchase over the cost of a conventional reefer truck, but I also have huge annual savings on insurance, maintenance, and repair over that of the cost of a regular reefer truck. Another bonus that I found is the new revenue stream that I have from renting the trailers out when I’m not using them for my seafood business. Local restaurants and caterers are often looking for mobile refrigeration for either special events or to do breakdowns or renovations. The Cooler Trailers have a much easier and more convenient access than a conventional reefer truck. Not only is it just one short step to get into the wide back door, but it also has a cooler curtain to help keep in the cold when the door is open. That also keeps the health department happy. Having owned a couple of seafood restaurants myself, I know the stress of your refrigeration breaking down on a hot summer day and hoping and praying that your refrigeration repair person can get there in time and fix it before your product reaches unsafe temperatures. Whether you need to rent one for a short term issue or purchase one to help with your long term goals, to me, cooler trailers are a no-brainer. Tom: Hey, Steve. Thanks for the great word. We appreciate it. Our Fortune 500 clients include these companies and more. Plus, Cooler Trailers have been used at several Super Bowls, PGA events, including the 2014 Masters and toured with country and rock superstars. Now, look at your two choices today. You can take advantage of all the benefits and ease of use that Cooler Trailers offer you, or you can opt for the same headaches that drove you to this page in the first place. Less cash in the bank from the high cost of refrigerated vans and trucks and continued frustration over an expensive specialist costing you thousands of dollars every year to repair and maintain your existing equipment. The choice is yours, and it’s clear. Make the only smart move you can make right now, and click on the “yes, I want to learn more button below right now.” I’ll greet you personally on the next page. This entry was posted on Tuesday, December 9th, 2014 at 2:30 pm and is filed under Uncategorized. You can follow any responses to this entry through the RSS 2.0 feed. You can leave a response, or trackback from your own site.